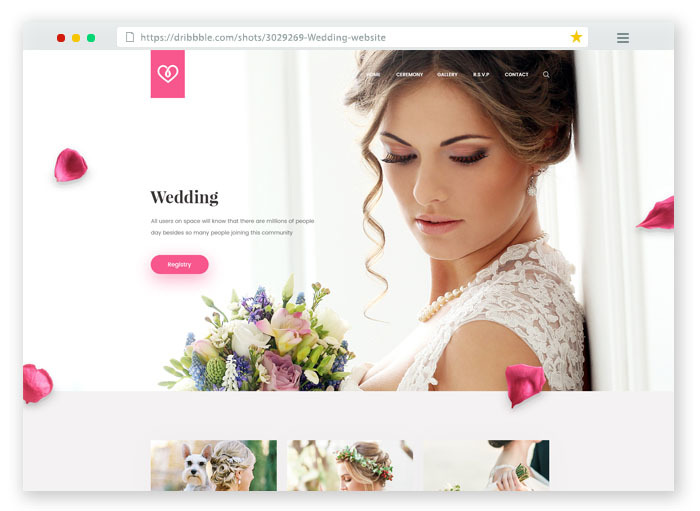 Nowadays, all wedding partners & wedding planners create a website with the purpose of wedding planning which shows guest list, bride and groom wedding images and all. 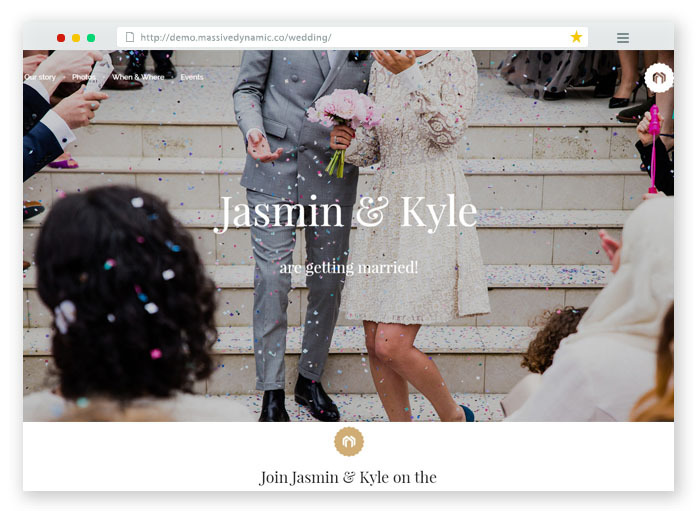 Also with the help of a wedding website, we can share & show about the wedding plans to the guests. The information of wedding day like date, time, transportation, honeymoon etc. are also shown on the website. 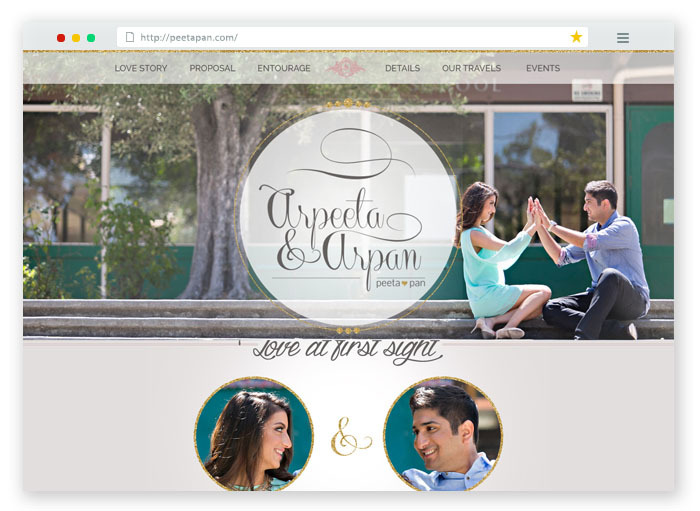 Here you can find some awesome wedding websites made by the couples for their wedding. As you can see most of the websites have story timelines, photo gallery, online RVSP form, countdown timer etc. 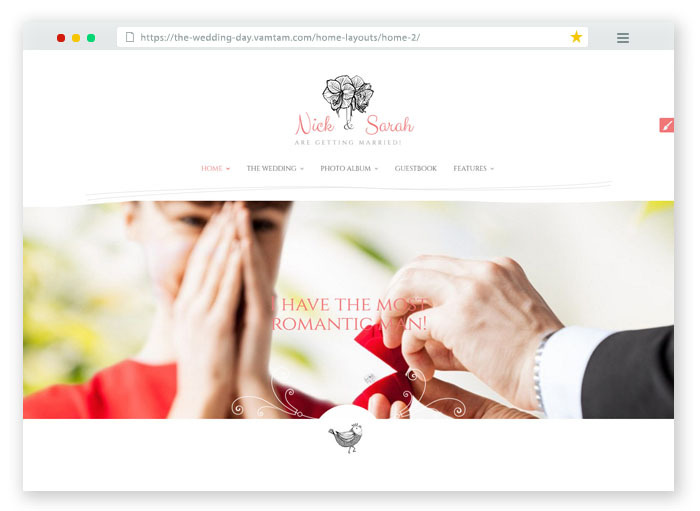 Go through the following wedding websites to see their amazing website designs which will inspire you to create your own. 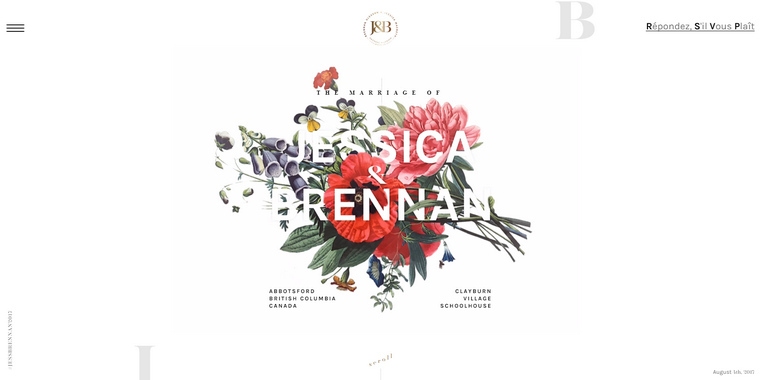 Jessica and Brennan created an awesome wedding website, which is really good in design & layout. This website shows the spirit between both the couple through the proposal image shown on the website. The website is simple but it shows most effective ways of using different colors and typography designs. It also shows the features and programs of the wedding. Online RSVP form is available at the bottom of the website which can only be filled with an invitation code. 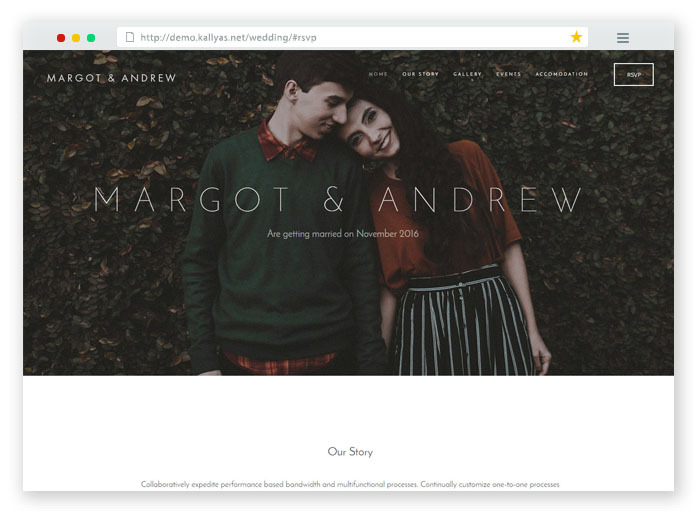 Overall an amazing website design for any wedding website which needs a unique look from the rest. 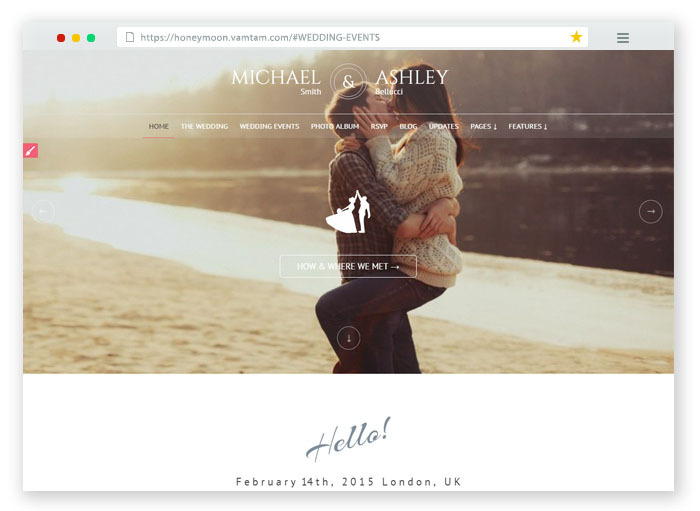 Michael & Ashley uses a pre-made layout design made by Honeymoon and Wedding theme that lets you create a simple website which shows the passion in design for the great day. The scheduled time of events and photo albums will also be available on the website. Also, it has a countdown timer which will show the time remains for your great wedding day. 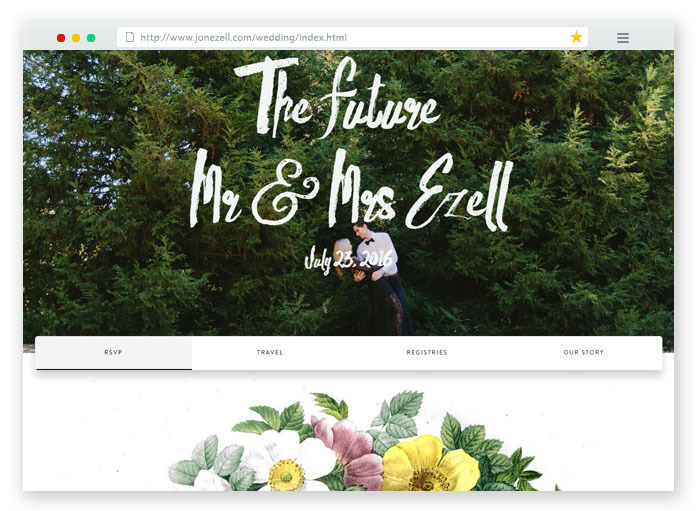 More WordPress wedding themes are listed here for anyone who want to create their own awesome website in seconds. 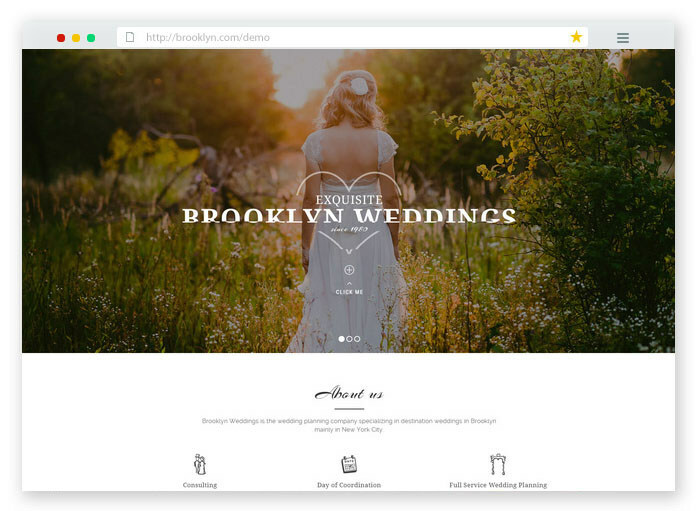 Brooklyn Wedding is a wedding planning website which uses the Brooklyn theme to create the website for you and also uses the WordPress platform. The information regarding packages for the wedding is mentioned on the website. Here we show a theme which is specially designed for wedding events. 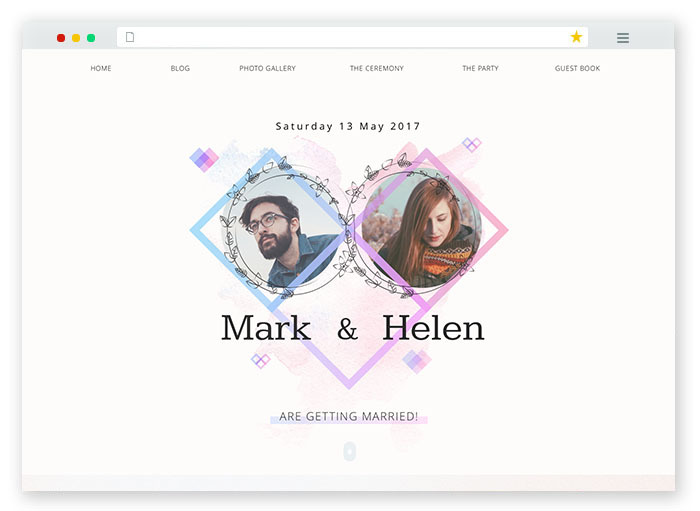 The theme(Massive Dynamic) will let you create a cool website which has a countdown timer, photo gallery and also shows wedding timings. The story timelines are shown at top of the website and the platform used is WordPress. Wedding is a website made for the purpose of exposing images, plots and wedding scheduled timings etc. The platform for the website used here is WordPress. 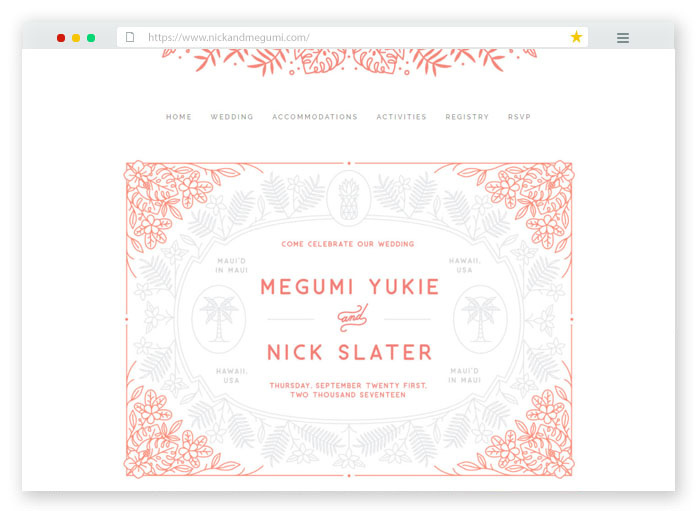 Nick and Megumi created a simple & sweet website which shows the date and further information regarding the wedding. Also, the details regarding accommodation are available at the top of the website. The online RSVP form is also available at the top of the website. My super sweet wedding is a website created with an awesome design which shows the bride & groom images with a plot. The photo gallery is shown on the bottom of the website. The story timeline of bride & groom is also visible on the site. 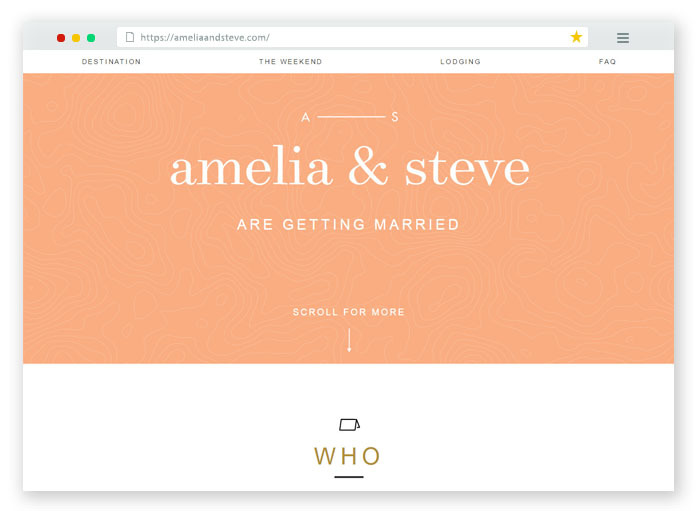 Amelia and Steve created an amazing website which looks so simple but it shows all the valuable information like the wedding place and date of the wedding. The transportation facilities are also shown on the website and the platform used here is WordPress. Karina and Agnes created an awesome website which shows their lovely images. At first look, the website is very simple but the design & layout they choose looks so good and further details of contact and inquiry for wedding are also shown on the website. The platform used on the website is WordPress. Arpeeta and Arpan have created the website which looks very attractive. The website shows their marriage date and also the website design is very classy which made it more attractive. The wedding event details are also shown on the website and the platform used on the website is WordPress. 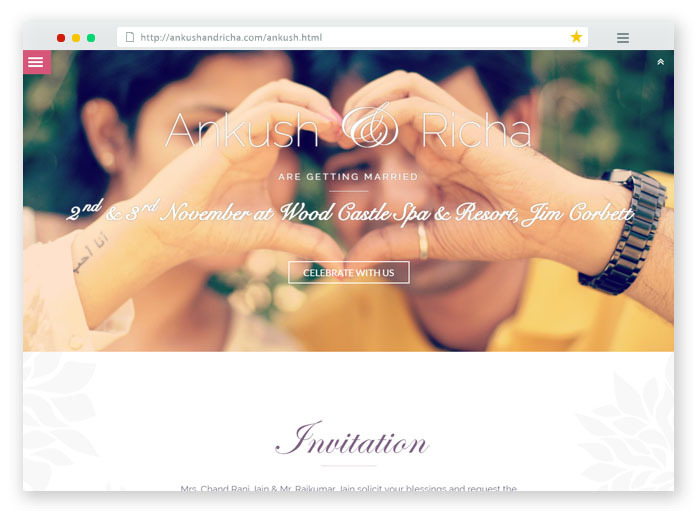 Ankush and Richa created their website with traditional style but it really looks good and the invitation profile & details shown is simple which makes it more attractive. Along with wedding ceremony, engagement and other details are also shown. The scheduled event timings are also mentioned on the website and the platform used on the website is WordPress. 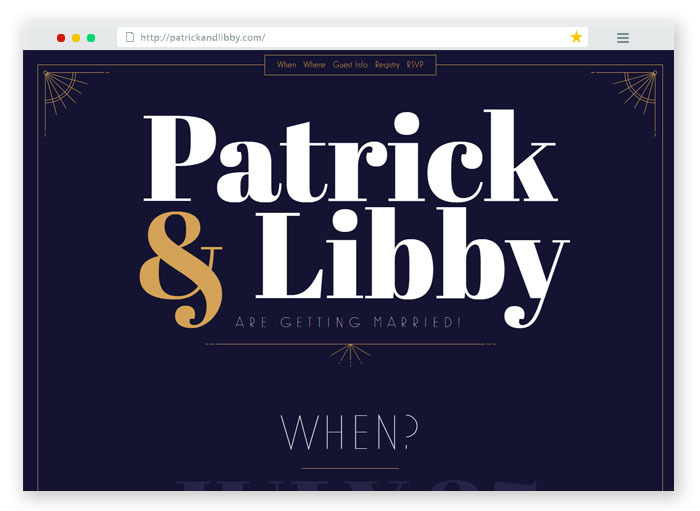 Patrick Hill and Elizabeth created a mind blowing website. It shows the time of the wedding ceremony, cocktails, dinner and after party. The Online RSVP form is available and wedding gallery too. Hotel accommodation and transportation details are also shown on the website. The platform used on the website is WordPress. 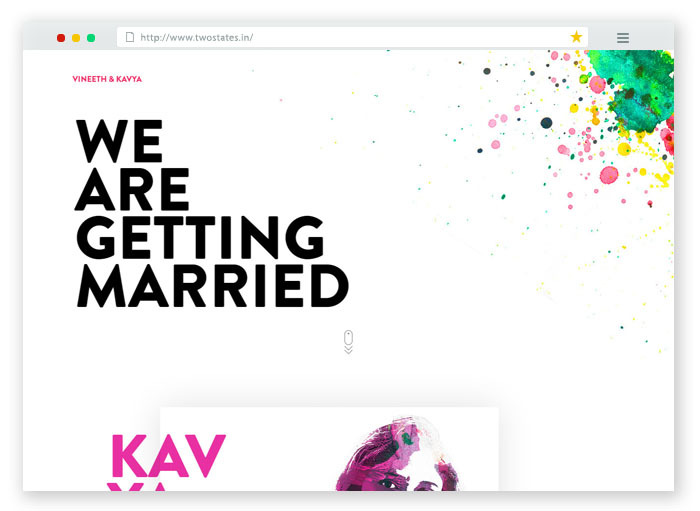 Vineeth and Kavya created a website with a different design & layout as compared with normal wedding planning websites. 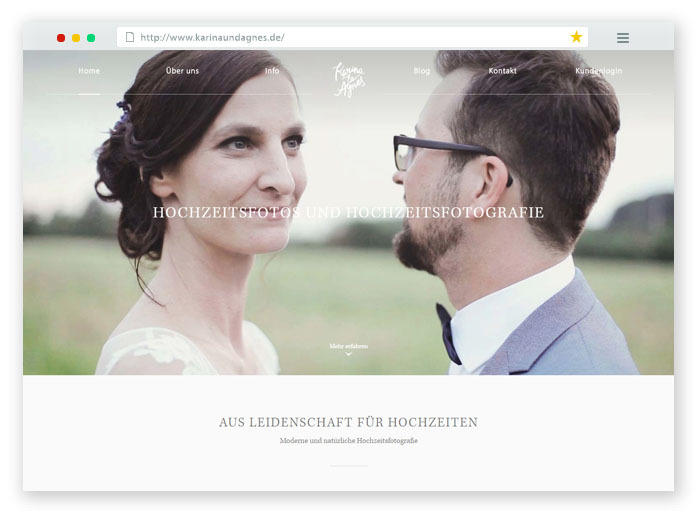 The website which shows an artistic effect on the images of the bride and groom. The date, place and time of the wedding are also shown on the website with an impressing effect. 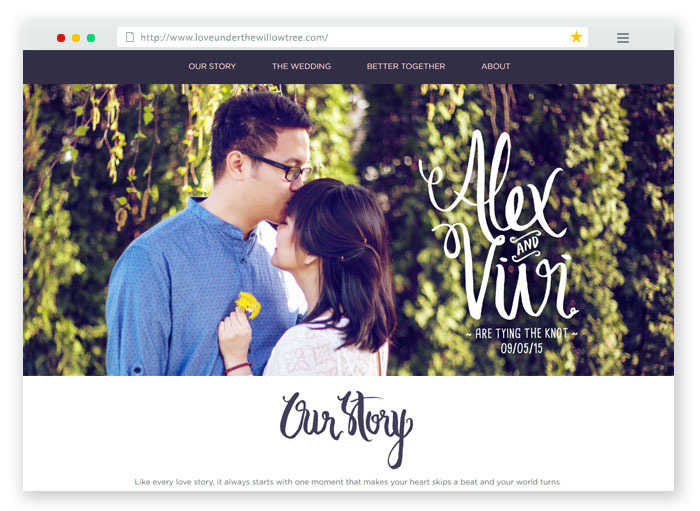 The wedding website of Alex and Vivi looks so stunning with the appearance of a rose flower and their passion showing an image at the front of the website makes it look so attracting. The story timeline and wedding day information like Wedding Ceremony time, Lunch time etc are also given on the website. RSVP form is also available. Bride & Groom photo gallery is also visible at the bottom of the website. 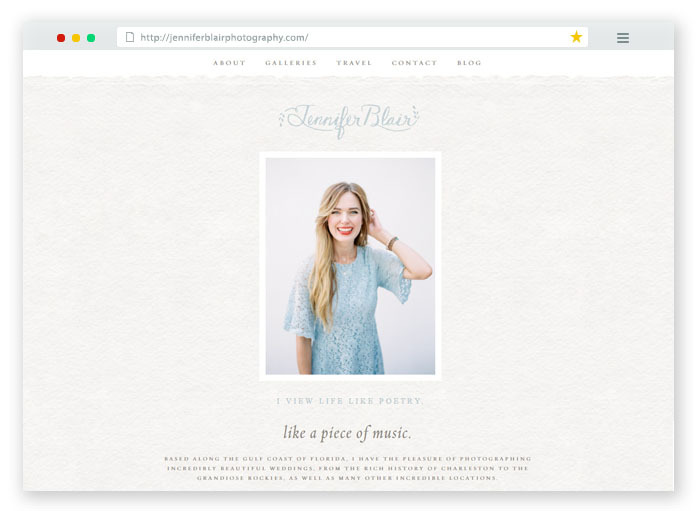 Wedding Day created a mind blowing website which shows your images on both sides of the website along with personal information. This website has a countdown timer which will show the time remains for your great wedding day. It also shows the time of main ceremony and wedding party. The Online RSVP form is available and wedding gallery too. The platform used here is WordPress. 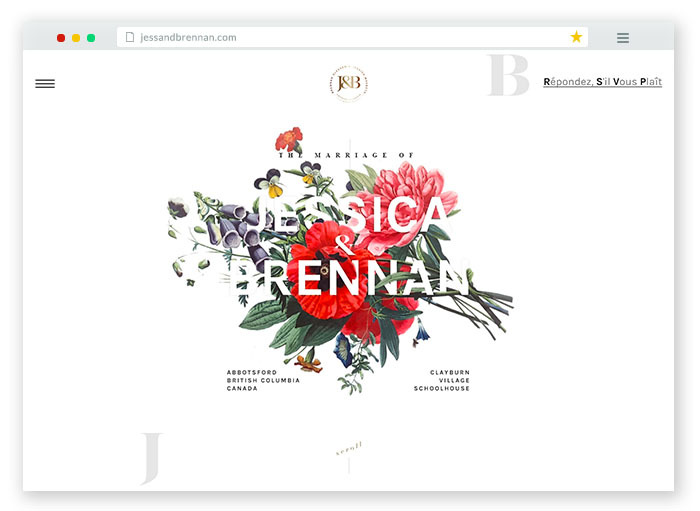 The wedding website of Jon and Tiffaney looks awesome with the design & layout. The website is very simple on first look but all the information like wedding day & time is mentioned on the website. The direction to the hotel is shown on the bottom of the website and the hotel facilities are also shown.The platform used here is WordPress. 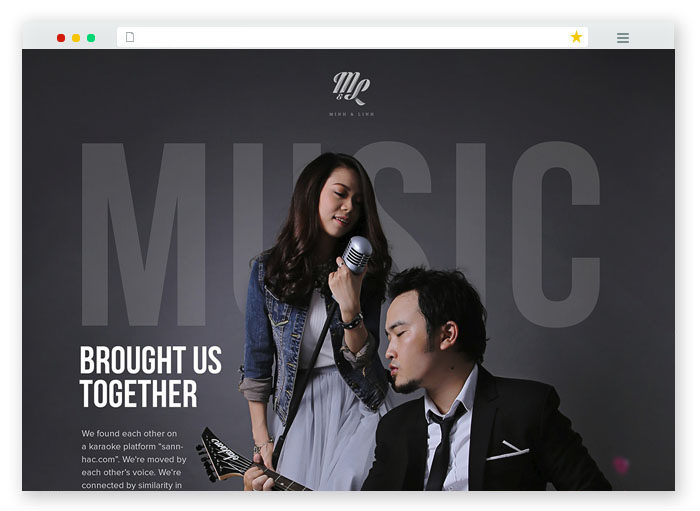 Mark and Helen created a website with a colorful design yet it looks very simple and that makes it more attractive. The information regarding the party and the photo gallery is shown at the top of the website. The website of Jennifer Blair shows her skills on Photography and by looking to her photo gallery itself we can see her passion for photography. Her perfection on taking photos made the website look so stunning. The Social networks which she connected to are also shown at the bottom of the website.The platform used here is WordPress. 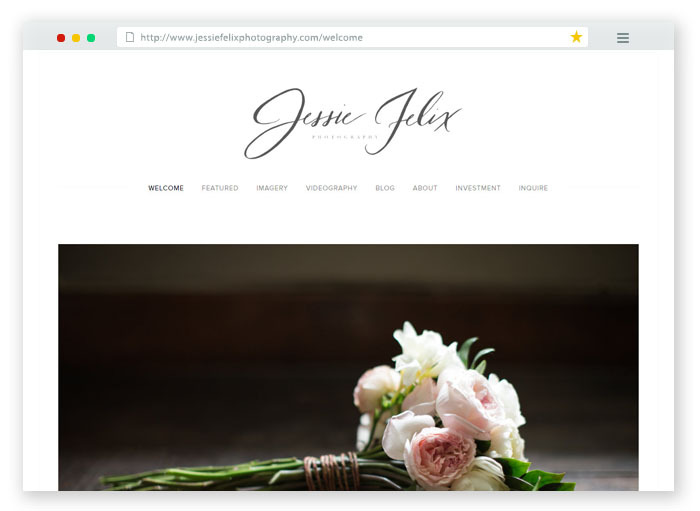 The website of Jessie Felix shows her passion and love for Photography. The website shows the image gallery and other valuable information.The platform used here is WordPress.